17-Mile Drive is a popular cruise through the unincorporated community of Pebble Beach. Even though a section of it is free and runs through Pacific Grove, the most famous and talked about portion is through Pebble Beach and does require a small admission fee. This 16.78-mile drive offers spectacular views of the Pacific Ocean with many interesting stops along the way. It's where you will find the famed Lone Cypress, gorgeous white beaches, and pristine golf courses. In total, there are 17 marked stops on this route. While most people enter through the north gate and head south, you can also start from the south and head north. It is not a one way street nor a loop, but is a two lane roads that allows you to drive either north or south. The drive itself is not part of either a National or State Park, so you won't be able to use those passes to enter. You will find 17 marked spots along the drive. Even though all of the 17-Mile Drive stops are gorgeous, there are a few that stand out. These are the 9 stops that I recommend. I've sorted them in order from north to south, since that's the most popular route. All stops have a sign similar to this with the name of the attraction and its number on the official 17-Mile Drive Pebble Beach map. I've added the corresponding numbers in parentheses to each stop based on the sign you will see when you arrive. This is also the number you will see on the official map of Pebble Beach, which you will receive from the gate when you enter. Spanish Bay Beach (#3 on the map): You will find a beautiful, soft white beach on your first stop. You can stroll along its boardwalk or take off your shoes and feel the sand between your toes. This beach also backs up against one of the gorgeous golf courses here called The Links at Spanish Bay. Point Joe (#5 on the map): Point Joe is my next recommendation on your 17-Mile Drive adventure. Back in the day, this rocky area was often mistaken as the entrance to the southern end of the Monterey Bay and several ships crashed here. You will also find a lookout point here that tells you more about who Joe was and why he was important. You will also get great views of this rocky area and the water. 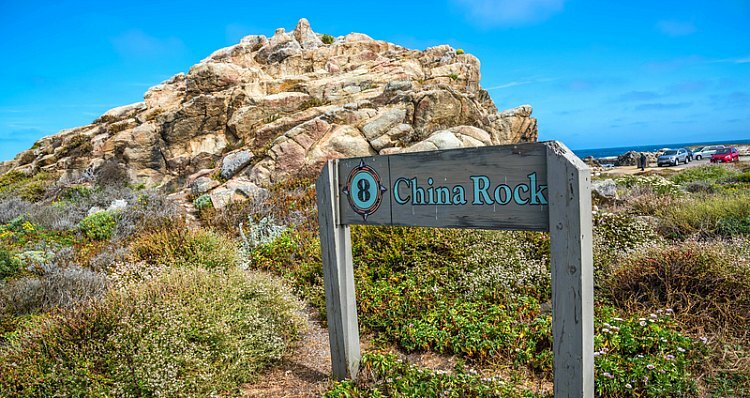 China Rock (#6 on the map): My next recommended stop is China Rock because this is an interesting historical stop. It used to be home to a small Chinese fishing village. Take a close look at the rocks as you can still see a bit of caked on cooking smoke from the late 1800s. Bird Rock (#7 on the map): The next stop is perfect for nature lovers. This stop along 17-Mile Drive is called bird rock due to the number of birds in the area. It's also home to several sea lions and seals. It's rocky shores also make for some great photo opportunities. Cypress Point Lookout (#10 on the map): Cypress Point is another interesting and worthwhile stop. It has amazing views and is a great place to see the sunset. It's also the western most part of southern California (the "official" dividing line between Northern and Southern California is about 25 miles north in Moss Landing). The Lone Cypress (#12 on the map): The Lone Cypress is probably the most famous stop along the 17-Mile Drive. 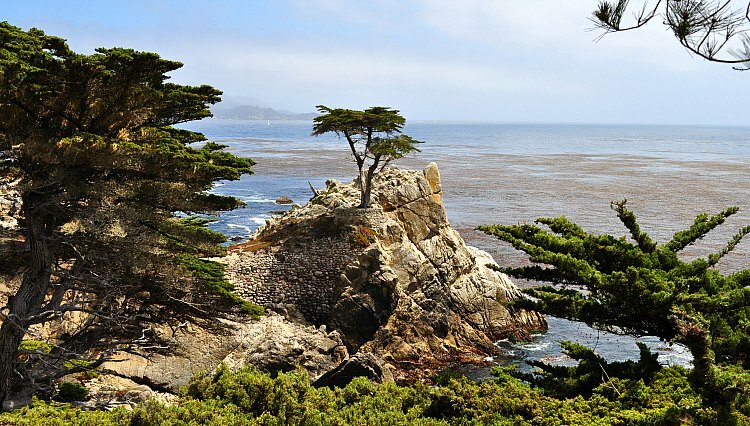 There is a single Monterey Cypress tree living on a rock just off the shores of Pebble Beach. It's estimated to be more than 250 years old. The tree took a beating during a massive storm in 2019 when its smaller branch broke off it. However, it's still alive and thriving as strong as ever. It is a wonderful stop along this scenic drive where you'll want to take a photo since it is so famous. You will also see this tree as part of the official logo for Pebble Beach. Ghost Trees at Pescadero Point (#13 on the map): These unique and spooky trees here are like the Lone Cypress from stop #12 because they are also Monterey Cypresses. These trees have been bleached white and has their bark stripped by the harsh winds and rainstorms in this area. This area also used to be a famed, but very dangerous, surfing spot. Make sure to check out the powerful waves below during your stop here. Pebble Beach Visitors Center (#14 on the map): The Pebble Beach Visitors Center features more than 20 exhibits that explain more about the history of this area. It's also a retail shop where you will find drinks and can buy souvenirs of your journey. You can also check out their interactive map to make sure you didn't miss any highlights during your cruise along 17-Mile Drive. 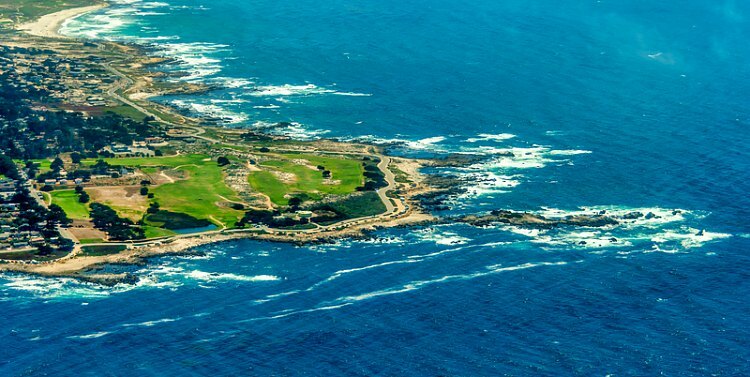 Pebble Beach Golf Links (#15 on the map): This is the world famous golf course that you will often hear about when people refer to "Pebble Beach." This stop includes a chance to see the greens up close. You can watch golfers on the first hole on the course as they are just getting started with their round. You can also check out the 18th hole to see those that are just finishing. Don't want to drive on your own? Check out these guided tours from San Francisco that include a chance to explore the 17-Mile Drive. There are five gates leading into 17-Mile Drive. Each one charges just over $10 per car and allows you access to all the stops mentioned above. These are the five gates listed from north to south. Pacific Grove Gate: This is one of the most popular gates and is the best option if you are coming in from Monterey or Pacific Grove. Take 17-Mile Drive through Pacific Grove to arrive at this gate. It just south of Sunset Drive. Country Club Gate: This is another popular entrance gate for 17-Mile Drive. This one is also near the northern end. It's on Forest Lodge Road just off Congress Avenue. S.F.B. Morse Gate: This gate is on Morse Drive. It's right off Highway 68/Holman Highway. Highway 1 Gate: This gate is off exit 399A. Stay in the left land to enter the roundabout. Take the 2nd exit out of the roundabout (it's almost a straight line from where you enter) and follow the signs to Pebble Beach/17-Mile Drive. Carmel Gate: This is the south gate into Pebble Beach. Head north on San Antonio Avenue through Carmel-By-the-Sea. You will find the gate right after 2nd Avenue on San Antonio Avenue. The gates are open to the public from sunrise to sunset daily. If you are staying at one of the resorts in Pebble Beach, your entrance is free. Otherwise the cost is just over $10. Make sure to bring cash for the payment. Monterey: The Pacific Grove Gate is about 4 miles from Monterey. Make your way through Pacific Grove on Pine Avenue until you hit 17-Mile Drive. This will take you to the gate where you will pay and enter the Pebble Beach section. San Jose: The Highway 1 Gate is your best entrance point when coming over from San Jose. It's about 75 miles from San Jose, so plan for a drive of about an hour and 20 minutes depending time of day and traffic. Take 101 south to exit 336 (toward Monterey/Peninsula). You will be on Highway 156, which turns into Highway 1. Then follow the directions above to find this gate. San Francisco: Either the Pacific Grove Gate or the Highway 1 Gate is best if you are coming down from San Francisco. It will take about 2 hours and 30 minutes in non-rush hour traffic. Santa Cruz: It's usually about 45 minutes to get to the Highway 1 Gate from Santa Cruz. Jump on Highway 1 just outside of Santa Cruz and then head to exit 399A. It's the second exit out of the traffic circle. You will find places both inside Pebble Beach as well as nearby it. Here are a few of my top picks. The Inn at Spanish Bay: This 5-star hotel is always rated as the best in Pebble Beach. It's surrounded by the Spanish Bay Golf Course and many rooms offer views of the course or the Pacific Ocean. It's absolutely breathtaking and offers everything you want in a 5-star luxury hotel. You will find it at 2700 17-Mile Drive in Pebble Beach. Check TripAdvisor for recent reviews and room availability for your stay. The Lodge at Pebble Beach: This is another one of the high-end hotels inside the gates of Pebble Beach. The Lodge is a 5-star gem for those that want the height of luxury. You are within walking distance of the new welcome center with plenty of places to eat and shop nearby. You will find it at 1700 17-Mile Drive, Pebble Beach. Check recent reviews and availability for your stay on TripAdvisor.